Can I just say again, I love being able to talk into my phone and “write” content for my site! One thing I’ve learned throughout my career is that a lot of people both in the corporate world and just in life, in general, want to become leaders. Leadership is something that is desired and hoped for by many people and basically every area of life. In the corporate world, and especially in the marketing world to become a marketing leader you need to show that you have marketing skills but also the desire to continue to enhance and learn more skills as you grow. Leadership is not something you’re born with. 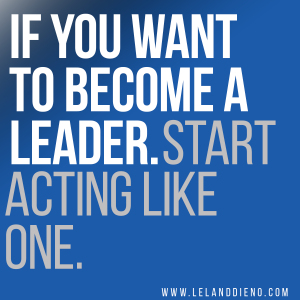 Leadership is a skill set that you acquire as you learn as you grow and as you gain experience. I don’t believe that anyone is born with the skills to lead people. Something in your life or multiple things throughout your life start to add tools to your leadership toolbox. The greatest thing I can recommend to younger people and their marketing careers is that if you want to become a leader you need to start paying attention to your mentors your leaders and the executives in the company you work for. Leadership is about every decision you make, every reaction every meeting every decision and everything you do when it comes to your career and your daily workload. If you want to lead people as a senior executive in a company or even as an executive in your own company while you’re at the junior level you have to start showing that you have a desire to become a leader, the desire to become a great leader and that you want to empower other people around you. The simple notion of time equalling growth is non-existent. You can sit in a company for 20 years showing no inclination of the fact that you want to become a leader and that you want to empower people and you will stay in that same position the entire time. if you expect your executives or your bosses to simply promote you because you’ve been there and you put in work you’re falsely misguided. Especially in the marketing world where digital is rapidly changing the landscape in the required skill set needed to execute on your job. Start reading, start listening, start trying to understand how people work and how relationships with people build trust and can help you generate business. leadership is not simply about putting in work, leadership is about having a desire to do amazing things and to empower your teams to be a part of that Journey. If you’re at a junior level and you’re working with multiple people on projects in collaboration start working on your leadership skills at that point. Empower your team members around you to be their best, empower them to want to learn and want to work hard and want to achieve success for everyone around them and everyone on your team. There is an opportunity for leadership at every level within an organization.